You can simply and effectively streamline your workflow by creating macros for support requests that can be answered with a single, standard response. This saves you the time and effort of crafting a separate response to each customer with the same issue. Want to know more about our products? Get an overview of Zendesk ticket management. This sets the ticket status to closed. If it is an incident of a known problem, the requester will be informed via a comment that the ticket has been closed and recommended that they visit the forums for more information about the incident. This is a reminder that can be sent to the requester if they have not responded to a request for more information on a pending ticket. This tells the requester that the priority of their request has been downgraded to low and that there may be some delay in resolving their request. This macro is a shortcut for agents to assign a new request to themselves. These macros can be used as is, edited, or cloned, so you can modify and repurpose them as needed. You can manually apply one or more macros to a ticket at once. Keep in mind that what one macro does can easily be undone by another macro. Just as you can make bulk updates to many tickets at once, you can also apply a macro to more than one ticket using your views. See Managing tickets in bulk. So why would you apply more than one macro? A typical use case is a ticket that contains more than one question or issue, let's say two in this example. You might have set up two macros that both insert a comment into a ticket to answer each issue separately. By applying each macro to the ticket, you add two comments and address both issues in a single response. Fine Tuning: Learn how to improve agent productivity in Sylviana Ho's Fine Tuning: Agent Productivity. In a ticket , click the Apply macro button in the bottom toolbar. Typically, your five most commonly used macros from the past week appear at the top of the macros list. You can select one of these, begin typing the name of the macro, or scroll through the list to find the one you want to use. The most-used macros display can be disabled, in which case, you'll only see the all macros list. For information, see Disabling the most-used macros option. Note: Macros cannot be set up for specific channels. The actions defined in the macro will be applied. If the macro updated the ticket comment, you can edit the text before submitting the ticket. To apply another macro, click Apply macro again and select another macro. Tip: Fine Tuning: Check out how we use macros to manage tickets with Jilliana Peterson's Fine Tuning: How Zendesk uses Zendesk, Part 1. Not sure if it has been asked or answered already, but from the article it looks like you can create "folders" of Macros (in example, Flash Photography>). Is there instructions somewhere on how to do this? This creates a nested list of the macros. Following up on Jen's post from October 01, 2014 12:48, is there any option to set which problem the ticket will be related to? I poked around in Macros and Triggers, and I don't see the "Linked problem" field available as an action anywhere. We just sent out an invitation to a beta, the requests are all to be turned into Incidents attached to the master problem ticket. I've created the macro to tag things, set the right reply text, etc. We can make it an Incident, but it would be really nice to peg the right problem as well. Second that. I've wanted to use macros to link incidents to their problem ticket for some time. As an Admin, is it possible to view and edit an agent's personal macro? Personal macros can only be viewed and edited by the agent who created them. It's not possible to disable it at this time. A number of people have given Erin, the Product Manager for this feature, the same feedback here. I'd recommend subscribing to that article so you can stay up to date on the conversation as Erin comes back with more information! someone knows how I can set-up a trigger that apply a specific macro? Is it something that is avalaible for professional zendesk licenese? Is there an option to make a personal macro a shared macro, or do I just need to remake it? I try clicking the drop-down but it only shows "Only Me". Admins can make a personal macro a group or global macro. If you are not an admin - an admin could upgrade you temporarily to perform this action. Currently I have to select the "underscore section" and replace it with customers name. Is there a feature to just click on the section and have it start ablank to enter the details needed? I feel like we waste some time just selecting those sections. Sorry if my terminology is not correct! Thanks! Have a look at placeholders. You can automatically populate your macros with customer specific text. If I want to reassign a ticket to another department, example: Wrong depart to request a ticket from. How can I apply a Macro without worrying about it setting off a triggered event? I want to be able to manually apply the macro, then reassign. This would fully depend on the Trigger you're wishing to avoid and the Conditions of that Trigger. If you know the specific Trigger that will fire if you use a specific Macro, what you could do is add a Condition to the Trigger to not Fire if it sees a certain Tag, like "dont_fire". And then add an action to your Macro so that it adds a Tag the Tag, "dont_fire." That would keep the two form overlapping. Hi, How can I alphabetize our macros automatically, rather than manually rearranging the order? To order them alphabetically in the agent-facing pick list, click the “…” context menu at the top of the macro list, choose Settings, and disable manual ordering. Give that a try and let us know if it works or if any additional questions come up. I've searched around and haven't found any discussion about populating public comments with standardized replies for common situations and managing the messages' content. My team has an extensive list of common replies that we copy from a separate platform and paste as a public comment to get started replying to a ticket. To consolidate our documentation and streamline our responses I would like to integrate the management of common public comments directly into Zendesk instead of storing the content in a separate platform. I have already considered running a small test with a select group of template replies but am not able to do that. My guess is that Macros that are nested according to a common topic, e.g. Desktop, Cloud, and Mobile, would be a good starting point for managing standardized replies for public comments within Zendesk, but I wanted to get a second opinion before I jumped down the rabbit hole. Any comments or questions are greatly appreciated. 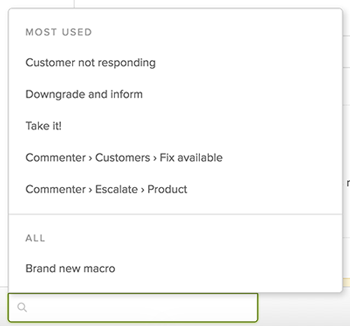 TLDR; my team pastes common replies for public comments that are copied from a separate platform, but are Macros the best tool to manage the common replies to public comments within Zendesk? Macros are definitely going to be the best tool for you. That's exactly what the feature was built for. I've never heard of anyone having too many macros...how many do you think you'd need? I doubt we have so many ticket templates that Macros won't be able to handle it. The bigger problem will be getting agents to adopt the new system. We have a common issue with agents sending customers macros that have previously been sent to the same customer earlier in the thread. Is it possible to have a macro be blocked from being sent to a specific email if it was already sent within a certain timeframe? There is not functionality around blocking macros; we've typically found the best solution to this kind of problem is good old agent training to look through and see if the macro has been previously applied. How to extract all your created macros from zendesk? I've been poring over the documentation, but haven't found an answer as to whether or not we can activate macros on a ticket via the API. This would be extremely useful in automating several of our processes. As a general example, say we have MACRO A that adds a comment to a ticket, and ticks off a checkbox (basically adds a tag that a certain task has been completed.) I would like to enable my users to fire MACRO A from an app built in-house that we use to process a certain class of tickets, without having to go back into the Zendesk GUI and opening the ticket, and clicking Apply MACRO A. Is this functionality supported anywhere?